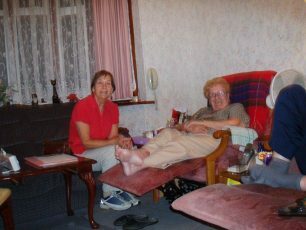 Margaret (left) and Kath Simons. Photo taken about 2010. I was born in Henry Street (now Allitsen Road) in 1928 and I am the cousin of Terry Farmer . I remember attending Barrow Hill Road School from 1932-1939, when the whole school was evacuated to the Chesham area. My 3 sisters Dot, Vera and Kath also went there, along with my 2 brothers, Eddie and John who attended after 1945. I remember Mr Hockin who taught sports, Mr Strong, I think he was headmaster, and Mr Jenkins(camel). I lived in Park mansions after being bombed out of Lisson Grove and we also lived Charlbert Court and Eamont Court. This page was added on 14/08/2012. So nice to hear from you both, due to living in Australia I probably won’t ever get the chance to walk the streets of St Johns Wood again so the older I get the more precious the memories become. Adrian, I remember you taking me into the stables in the barracks and trying to catch the mice that used to get into the horse feed containers, do you recall doing that? Are you both still in the UK? Adrian I remember you from Mrs Sadlers’s class. You and John Collins sat in front of Danielle and me and we used to chat together when the teacher was otherwise engaged. Great to hear memories of Danny Angel …….what a little character ! I missed him at my secondary school, dull without his humour and pranks. Although sometimes he was more a little devil than an angel. Do you remember the time he decided to lock Clive in to the school library, and poor Clive not fancying an overnight stay put his hand through the glass panel as Danny was pushing the door Micheal must have been off sick because he usually managed to reign Danny in. I lost contact with my old classmates when I moved further out. Only to Boundary Rd/Abbey Rd, but I also went out of the Wood to Maida Vale for High School. Where did most of Mrs Sadler’s class go on to ? Kynaston for the boys but where did the girls go. Remember you very well….can still see me going to tea at your house and being late home…remembering strolling in and my mother going ape….apparently the police were ready to start dragging up the canal. Danny Angel and Mickie Cohen were friends of mine…Danny is someone I hold very dear to my time in NW8….a little sod at times….but weren’t we all. I spent more times at his flat than my own. My Dad was in the Household Cavalry….Life Guards… and I lived at the Jubilee Buildings in Queens Terrace Rd,behind St Johns Wood tube station. Some of those names on your list were with me from the beginning of Robinsfield until the end of Barrow Hill. There is a couple more I remember….Mayumi Dan and Julia Fischer….Japanese and American girls. Great memories….and something I shall treasure. Good Luck and cheers for the class list that nudged certain memories. Tickled me to see that list of names….some I can vividly still remember. Reading both your comments brought back many lovely memories, I remember some names you didn’t mention so i have added them to the ones you both remembered. I can sill see most of there faces in my memory, hope they are all out there somewhere and doing well. I now live in Australia, had a good life, have a lovely family so very content, hope you return to this site and see my message, would love to here from your selves or anyone on the list. I was at Robinsfield and then Barrow Hill in the mid 1960s. I remember them filming the Dalek movies next door at St Johns Wood studios. Who remembers the tour of the boiler room? I was not allowed to go on it having been caught talking by the Head. I was taught by Mr Perkins who used to read the Hobbit to us. I remember wet breaks and watching a movie in one of the downstairs classroom on a Friday afternoon. I still have my 25 yard swimming certificate from that dreadful indoor pool. Mrs Solomon at Robinsfield and then Miss Wyebrow, Mr Lloyd, Mrs Sadler and Miss Money at Barrowhill. Mr Parker was the hugely wide headmaster. Somebody earlier mentioned the music teacher who was Mr Thompson. We all had to learn the recorder. My friends were Louise Hutton, Sandra Bremner and Linda Tompsett. I remember so much of those days even though we are talking more than forty years ago. It’s strange the things that you forget and someone else remembers, I have a total blank about the country dancing (was it Mrs. Grew of Nature Studies who organised it ?) I do remember the music and movement sessions when we were urged to improvise dance to classical music on the massive tannoy radio in the hall. The girls loved it of course and the boys loved sniggering although we got some to brave it in the end. Mrs Sadler decided we should have classroom talent show when things got slow at the end of Summer term and we were each told to think of something to stand up and entertain the class with the following day.Maybe it was a confidence boosting exercise. On the great day some of us claimed to have forgot while others stood front of class in a hushed audience. Clive attempted a card trick. Danny and Michael did a double act with jokes until Danny lost his temper with Michael. Christine and Alison did a very intricate clapping/singing song that we were all impressed with the dexterity of. I think Molly either recited or read a passage from a book ( maybe her dad’s as he was a childrens’ author ). I had learned the words and accompanying movements to “The Moon Shines Bright On Charlie Chaplin” from my grandad. Mrs Sadler was probably a bit non-plussed to hear a 10 year old singing such a quaint song with poignant lines like “And his old baggy trousers they’ll need mending, Before they send him, To the Dardenelles” ! The star of the show was Danielle Lewis playing classical guitar music while striking a Julian Bream pose. I can’t remember your party piece David ? Shortly after I wrote that last comment more names came back to me. I was wondering whether Bernard (Hyam) had been in our class or Mr Grews. That answers that one. His good friend was Graham Smith. There was Carl Upton, who always wore a tie & whose dad was a policeman. Kevin, a very slightly built lad who lived on Allitsen Road & could draw really well but in that way of things it was never brought out in lessons. Robert whose father was something to do with the US army but I never worked out what. Brian Aherne (or was he in Mr Grews class) & a boy that joined in our final year Charles (not Charlie) who lived round the corner from me in the house I always wanted to live in with a mezzanine(! )….but they pulled it down. His mother gave me my first avocado & I thought i was going to hurl. Now of course I eat nothing else:-). No more girls names I’m afraid. Unlike Julian I was a late developer & most girls were just an inconvenience. Julian & I eventually grew apart but hey that’s another story. Hello David, Really pleased to see your email ! All those names, I actually remember their faces. Billy’s surname was Keep and his dad was the caretaker on the Townsend Estate. I was forced to sit next to a boy called Bernard as part of Mrs Sadler’s gender equality initiative. Unfortunately I was also given the task of improving his reading skills. Needless to say he hated me for it. Do you ever see any of them. If you see Julian tell him I used to visit Molly’s after school. She returned to USA with her family when she was 12. I hope he gets over it . As for me I chose to go to Paddington and Maida Vale grammar school because I liked the colour of the uniform. I neglected to notice that none of the rest of my Barrow school class chums were going there. Which was quite alarming on the first day at the new school. I never liked it there. I spent most of the time awol. I can tell more about my escape to the hip and happening Holland Park school of hipsters etc. Thanks it would be great to get your email address . Yes I did wear tartan skirts but my hair went from very short to very long. Lorraine. I’ve just checked this site after so long & seen your, so much clearer than mine, recollections. How wonderful, you’ve remembered my best childhood friend Julian Maher. I think we would have been classified as ‘boys that could try harder’. Julian had trouble recognising his bs from his ds so I was forever leaning over like a best chum to correct things. He developed a crush on Molly Monahan in the last few months of school, much young angst on his part & I’m not so sure she was as interested. His mother worked on the ‘Yellow Submarine’ film & met The Beatles. Were always only a few steps from greatness but big steps! Do you remember that Mrs Sadler started us off, one boy sat next to one girl, no opt outs? Freedom of choice in that regard came later. I think she hoped it would make the boys less silly. Fat chance! I sat with Jacky Shaw. Very bright, general all round popular girl. I got on very well with her but I think her grades probably improved when I moved. So how about Country Dancing? Mrs Sadler just couldn’t get us boys to dance with girls & I think that probably suited girls to dance with each other. Italics. Were you an Osmiroid or Parker pen user? Do you remember Mrs Krummels first lessons with pens you dipped in inkwells. What a bloomin’ mess I made of that. Wet hair photos after swimming in that pool. My aged mother still has that up in her living room. It’s not as cute as she thinks. Mrs Sadler. You just have to read all the comments here from the 50s to the 70s, to realise what a towering presence she was at B. Hill. Hopefully there’s a quiet corner of the school with a blue plaque to her. You remember little of Robinsfield. How about this then? The very ancient Miss Moses who had us all cover the outside of our workbooks with embossed wallpaper culled from wallpaper books. So with the names you mention I’ve come up with a total of 16 for our class including ourselves, those already mentioned & Jacky Chienery, Clive Jones, Alison Backhouse, Valerie Tucker, Billy – surname lost in the mists – as is Mark but Samson, I’m not sure about. I’m thinking that might have been Marks surname but 50 years is a long time for detail. I’m really embarrassed to say I cannot fill in your details. Was it short hair, penchants for tartan skirts?? I would really be fascinated to know how your life went from there & whether you kept up with any of the people mentioned, (I went on to secondary school with most of the boys) but that really isn’t for this forum & you may not feel it’s right for you. If you do I will leave an email address- presuming you ever check back here again – if you request it, that you can contact me on. Another theme of the period was italic writing which we took endless painstaking lessons in using scratchy square nibbed fountain pens. Once I left Barrow Hill School I was never required to use it again. A shame because i was top of the class in it, along with elaborate composition writing ( story telling ). Worse in the class at arithmetic and any form of sports. Unfortunately summer terms seemed to involve a lot of rounders games .What about that strange, steamy mini swimming pool in the basement ! I remember those great Friday afternoon films in the hall. I suspect they were put on so the majority of the teachers could head off for the weekend, leaving only two to supervise. My favourites were the monkeys tea party ,and the two children who lived in a windmill and went everywhere in clogs and full dutch costume. I’d love to see these again, I wonder where the schools got them from. Also does anyone know what happened to Mrs Krummel my inspirational year 1 and 2 teacher.Her lessons were the most interesting I ever had and I still remember the ones on the Ancient Greeks ! Some of the other children in the class were; Avril Lebof, Christine Cadge, Danny Angel ( naughtiest boy in the class ), Michael Cohen, Molly Monaghan ( Tallest Girl )What were your memories of school days there ? I do remember you David Mawson ! You used to sit at the back of Mrs Sadler’s class alongside the second tallest boy in the class, Julian. It was your comment about being lined up according to height by the teacher that made me remember. I never thought about it before but they did have quite an obsession about height in those days. I, by the way was the second tallest girl, Lorraine Campbell, that was until an American girl called Molly Monahan joined our class and I was demoted. Do you remember Danny Angel the naughtiest boy in the class ?And poor Micheal Cohen who was assigned to be his mentor to make sure he behaved himself . Our teachers were interesting characters; Mrs Sadler had been in India before Independence and she had a massive swollen arm, which I think, she told us was the result of contracting bubonic plague out there ( surely not ) . Barrow Hill was where I had the happiest and most interesting school days. Robinsfield before it I only remember as being too big , too bright, too modern. All I remember about the teaching was having to belt out ” All Things Bright And Beautiful ” each morning. It’s a shame that there were no Class photos for our time there, only individual ones of us, usually taken after coming back from swimming with all our hair plastered flat. Happy Days. I was in Mrs Krummel and Mrs Sadler’s class the same time as David . My name was Lorraine Campbell then. If you remember Avril Lebof, Dian Leggett, John Collins and Samson ( I forget his surname ) then we were in the same class together. They were both great teachers, Mrs Krummel especially helped me a lot. She was very special to a lot of her pupils. An inspirational teacher. I’d love to know more about what happened to her. I went to Barrow Hill in the 1950s- early 1960s, I remember Mr Porter who ran the football team, Mrs Krummel that used to teach writing in italics, Mr Nash who used to pull your sideburns if you were naughty, can’t remember the teacher who in the cricket season used to set up stumps in the playground and if you bowled him he used to give you a tanner and thrupence if you caught him. I remember playing football in the playground and if you kicked the ball over the wall having to get it back from the furriers. I was working in De Walden buildings not long ago and how the school has changed, the playground was totally different and I believe the school now has an indoor swimming pool. I left in 1963 and my family moved to Beckenham in Kent and I went to the London Nautical school whereas most of the other boys went to Kynaston . My first memory of Barrow Hill was clinging to mum not wanting to stay at the nursery in about 1964. My recollections should be read as those of school life as perceived by a four year old. Our teachers, I think, were Mrs Chapman, a more mature lady I can imagine in a tweed skirt and sandals, and Miss MacDonald. We used to get told off for putting on the silver and gold dressing up skirts, sitting on the floor and spinning round and round in circles whilst listening to Swan Lake and other classical pieces. The skirts would of course get worn out. Another thing that was frowned upon was when we were painting and decided to flick the poster paint in the direction of the paper instead of applying it directly with a brush. When the weather was fine we would sit outside at a table in the yard and make necklaces by alternately threading cut up paper straws and bits of coloured sticky paper chanting paper-straw-paper-straw as we did it. At the end of the session we would all sit for a story. A favourite with Mrs Chapman was The Story about Ping by Marjorie Flack & Kurt Weise.The tale of a duck that gets separated from its family on the Yangtze River. I can remember staring hard at the wall behind her trying not to listen because it always made me cry. I think my years of attending were 1964-68 (I was born in June 57). Mrs Krummel was our year 1 & 2 teacher. She had been in one of the Nazi concentration camps & on my first day at school tried tell the class her story of returning to Poland for the first time the summer holiday just gone. At 7, I found the horror of what she must have gone through hard to grasp. She asked us all to draw a picture of her holiday. I drew a plane with Mrs Krummel waving from one of the windows. For that first year the boys had outside toilets with no roof & invariably no loo paper. Then loos appeared indoors in year two. Relief! Mr Porter was the headmaster, a very kindly gentleman of I guess the Edwardian era as he retired when our year moved off to secondary school & a Mr Parker took over. I remember that years 3 & 4 could go & lose themselves in St Johns Wood Burial Ground at lunchtime as long as their parents sent a note approving. How did we know when it was time to go back to the school? Friday afternoons were cine films (or you could play outside..all afternoon). Bits of film cut from larger films like the volley of arrows scene from Agincourt from Laurence Oliviers Henry V. Where did they get them? We all lined up after playtime in the playground in our classes, in order of height. If anyone remembers me I was always at the back. Still bashing my head on the top of door frames now. I went to Barrow Hill for 4 years and left in 1971 to go to Hampstead Comprehensive. Mr Porter was the headmaster and I remember Mrs Sadler. I had Mrs Konzon as a teacher in years 1 and 3, Mr Grew and an Australian teacher Miss Agnew in year 4. That year we learnt everything there was to know about Australia! geography, history, songs etc. The 11+ had been abolished the previous year in London so we didn’t have to take it.There was a brilliant drama teacher Miss Binstead and an eccentric music teacher; can’t remember his name! I went to Barrow Hill in the early 1960s. I was in Mrs Sadler’s, then Mr Nash’s class 4m and my friends were Terry Payne, Geoffrey Clark, Anthony Spencer and Phillip Carvil. I went to Barrow Hill from 1951 (age 5) to 1957, when I passed my 11+. I remember the head, Mr Porter, and Mr Nash and Mrs Sadler. I should have some class photos somewhere but can’t find them. In particular, pictures of the Coronation Pageant in 1952. Does anyone have those? I attended Barrow Hill Road School both before and after the war. I lived at 16 Newcourt Street – Just around the corner. My earliest memory was from before the war. 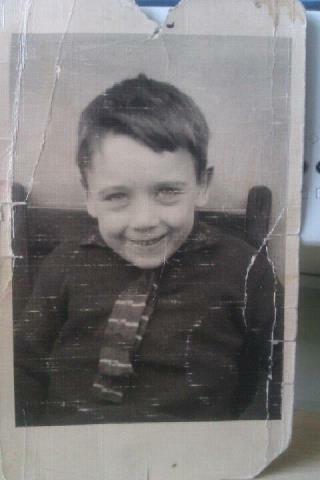 I was born on 9th June 1934 so must have been in the nursery school. I can remember having to lay down on a little bed and pretend to sleep. My next time was sometime during the war when we went downstairs to the air raid shelter which was in the space under the main building. We sat around in a circle and played math type games. Next time was at the end of the war in early 1945. I came back from being evacuated during the buzz-bomb period. I was very lucky to be able to take a special 11+ exam very close to my 11th birthday. I was even luckier and surprised everybody by doing very well in the exam and was called up into the head mistresses office to be informed that I had first choice of which school I would attend. I chose the Regent Street Polytechnic. I have written previously on this site but am wondering if anyone knows about the open air school in Regents Park, I went there from Barrow Hill for a short time in the Summer after having my tonsils out ? Do you remember two long poles in the playground, or the restaurant at the train station serving hot sausages or the old wooden escalators or smoking on the trains, oh glorious days. I attended Robinsfield in the late 50’s they had just finished the annexe ( the low building on the right). Miss Phillips was the headmistress, then I went to Barrow Hill, I remember Mr Nash, Mr Maddison, Mrs Sadler, and the Headmaster was Mr Porter. Then I attended Kynaston. It was when education was at its very best in this Country, we didn’t always appreciate it then but we were very lucky, I think. After leaving Robinsfield I attended Barrow Hill up until 1974, I can remember Mrs Sadler the headmistress, and a certain teacher John Nettles that left in a hurry to pursue his love of acting & turned up on the Liver Birds as the boyfriend, later to become Bergerac.